Hot off the presses! 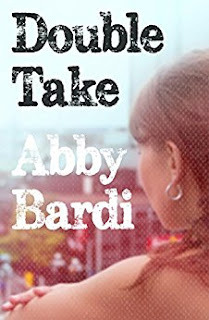 DOUBLE TAKE by Abby Bardi is available now! Leave a comment for her below to let her know you stopped by! Set in Chicago, 1975, Double Take is the story of artsy Rachel Cochrane, who returns from college with no job and confronts the recent death of Bando, one of her best friends. When she runs into Joey, a mutual friend, their conversations take them back into their shared past and to the revelation that Bando may have been murdered. To find out who murdered him, Rachel is forced to revisit her stormy 1960s adolescence, a journey that brings her into contact with her old friends, her old self, and danger. I recognized his voice from across the room. When I handed him a menu, he looked up absent-mindedly and went on talking to some guys, then did a double take. I tried on the name like an old article of clothing to see if it still fit. It felt like a suede fringed jacket. “Yep,” I said. “You look exactly the same,” I said. He was wearing a beat-up leather jacket over a green T-shirt, maybe the same jacket and T-shirt he had always worn. His thick black hair was shorter now and curly, skin still tan from summer, small mouth with perfect teeth. He still looked tough and handsome, but in a creepy way, like someone you couldn’t trust. “Okay, Joey,” I said, since this was nowadays. “Miss?” a voice called from a nearby table. The voice brought me back to where I was standing, in Diana’s Grotto, a Greek diner on 57th Street, with ten tables full of customers. For a moment, I had thought I was in Casa Sanchez. It took me a while to make it back to Joey’s table. A divinity student had found a fly in his milkshake, and it wouldn’t have taken so long if I hadn’t made the mistake of saying, “So, how much can a fly drink?” Like most academics, this guy had no sense of humor and gave me a lecture on hygiene. It was amazing that knowing as much about hygiene as he seemed to, he would continue to eat at Diana’s Grotto. By the time I got back to Joey’s table, the men he had been sitting with were gone. Off-duty police, from the looks of them, I thought, or plain-clothes. We got a lot of cops in Diana’s; they slumped on stools at the counter with their guns hanging from their belts, sucking down free coffee. Back in the sixties, the sight of their blue leather jackets had always made me nervous, like I’d committed some crime I’d forgotten about. “Collegiate? Don’t ask.” I slid into the booth next to him. From across the room, Nicky, the maître d’, shot me a poisonous glance. I ignored him. “I like it here.” I smiled a crazy little smile. I felt someone hiss into my ear. Nicky had slunk up behind me. He looked like a garden gnome in a plaid jacket and baggy pants, reeking of aftershave that had tried and failed. “Rose!” he snapped. He never called anyone by their right name. “What’s in a name?” I always murmured. “Be right with you.” I gave him what I hoped was a reassuring smile. “This is a classy place,” Joey said as Nicky ambled away. 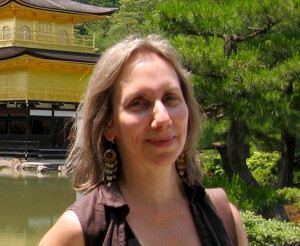 Abby Bardi is the author of the novels The Book of Fred, The Secret Letters, and Double Take. Her short fiction has appeared in Quarterly West, Rosebud, Monkeybicycle, and in the anthologies High Infidelity, Grace and Gravity, and Reader, I Murdered Him, and her short story “Abu the Water Carrier” was the winner of The Bellingham Review’s 2016 Tobias Wolff award for fiction. She has an MFA in Creative Writing and a Ph.D. in English from the University of Maryland and teaches writing and literature in the Washington, DC, area. She lives in Ellicott City, Maryland, the oldest railroad depot in America.